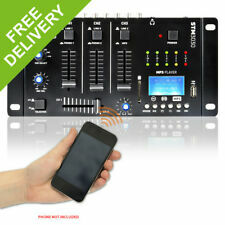 Resident DJ DJ-25 Mixer Amplifier Bluetooth USB black/blue. Selector lever Line2 / USB / BT. Selector lever Phono / Line1. Compact & versatile : all connection options for a conventional DJ setup and a built-in amplifier. 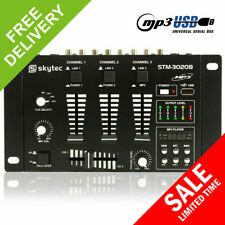 Skytec STM-2270 4-channel mixer Bluetooth USB SD MP3 FX. compact 4-channel mixer with Jack and RCA connectors for start-up DJs or small concerts. Compact 4-channel mixer with Bluetooth interface, MP3-capable USB and SD ports as well as RCA and jack inputs. The warranty covers manufacturer faults and does not cover misuse of the item, for example a 'blown out' speaker. Main Features. Input Line: 150mV. Line Input: 150mV. Installation Speakers. Air Conditioners. 4 x Channels and 2 x Mic inputs. Auna Blackbird 6-Channel Mixer Mixing Console, BT, USB, MP3, 2 x XLR Microphone, Black. Flexible mixer: 6-channel mixer with many uses. Connections: 6.3mm jack headphone output, 2 x 6.3mm XLR microphone input, 2 x 6.3mm jack line input, 1 x 6.3mm jack line output, 2 x 6.3mm XLR microphone output, 1 x USB port. A 4-channel mixer with MP3 player and recorder with USB port featuring illuminated channel faders, assignable crossfader, Cue on each channel and a 3-band equalizer for microphone and master signals to get better mixing results. Record mixed songs in to MP3 format files in order to play these in other MP3 players afterwards. Main Features 4-Channel mixer MP3 player and recorder 6 Inputs with gain control 2 Microphone inputs with talkover function. Resident DJ DJ405USB 4-Channel DJ Mixer 2 x Bluetooth USB SD AUX Recording Function. 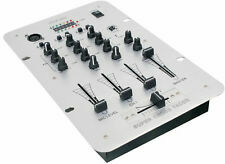 Theresident DJ DJ405USB is a talented 4-channel DJ mixer. Alternatively, the USB ports and SD slots open up the possibility of recording your audio signal as a WAV file. Weight: 5kg. Signal to noise ratio: >100dB. Output (Master): /-1V. Input Mic: 1mV. Input Phono: 3mV. THD: <0.09%. Frequency Response: 50Hz - 18kHz. Garden & Patio. Mixer Section. ·Leave a space more than 10cm between sides of amplifier and the wall for well ventilation. ·Put the plug cord into speaker jack with wall your force and confirm it. Input Sensitivity. 19" Rack Mountable Mixer. Power Input: 230V AC @ 50Hz. Height (mm): 90. Net weight (kg): 4. THD| <0.1 Percent. Frequency Response| 20Hz-20kHz. Replaceable Crossfader. Smoke Machines. Hifi Separates. Garden & Patio. LCD Display for Easy Mode Selection. Talkback and Crossfader. Vexus STM3030 4 Channel Mixer Bluetooth USB SD MP3 LED. The Vexus STM3030 is a4-channel mixer for the starter DJ. Black 4-channel DJ mixer with versatile connection possibilities via jack and RCA. Compact 4-channel mixer with integrated Bluetooth interface as well as MP3-compatible USB port and SD slot. Laptop / Tablet Case & Covers. Amplified Active Indoor Antenna Aerial AM FM Stereo Radio. LINDY BNX-60 - Bluetooth Wireless Active Noise Cancelling Headphones with aptX. Phone Cables & Connections. Phone Cases. A compact 4-channel mixer with USB/MP3 and its display, featuring microphone 2-band equalizer and talkover, 3-band equalizer on each channel, Echo, replaceable crossfader, headphone output on which any channel can be cued. Ideal for use in disco, club, bar, at home studio etc..
ThePower Dynamics PDM-C405A4-channel mixer with an integrated amplifier, USB and SD slot as well as a MP3 player and Bluetooth receiver is the star among mixing consoles. It is especially suited for performances by DJs, musicians and bands as well as for shows and live performances. 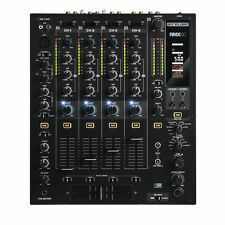 Resident DJ 22BT 2CH Mixer 3/2-Channel DJ Mixer 2 x USB 3 x 6.3 Jack White. Versatile 3/2-channel mixer with a huge variety of connections and 2 x USB. One of the special features of theResident DJ 22BTmixer is the Bluetooth interface for the wireless connection of a smartphone, tablet or laptop. Vexus STM2500 5-Channel Mixer Bluetooth USB MP3 EQ Phono. 5-channel mixer with a wide range of connection options via XLR, jack and RCA inputs and outputs. Black 5-channel mixer with a wide range of connection options via XLR, jack and RCA inputs and outputs. The MPX-20USB mini mixer ideal for use in confined areas. The product features 2 line/phono inputs stereo record output 1 mic input and intergarated USb Audio Interface. Crossfader : yes. Great for DJs who concentrate on the essentials. 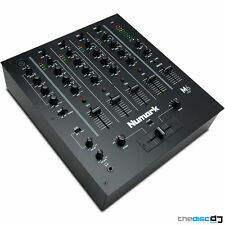 Numark M101 2-Channel All Purpose Compact Scratch Mixer BLACK Inc Warranty.